It’s the feast day of Saint Joan of Arc. In the park near my house is a statue of her dedicated on her 510th birthday in 1922. “The statue of our French heroine will be built to the glory of womanhood, dedicated by the women of France in New York, to the women of America, and offered to the city of Washington,” wrote Madame Polifeme. It is the only equestrian statue in the District that has a woman rider. I had the honor of reflecting on this statue with the wonderful poet Linda McCarriston and hearing her thoughts with regard to her powerful poem, below. she watched. … Read the rest of this poem. 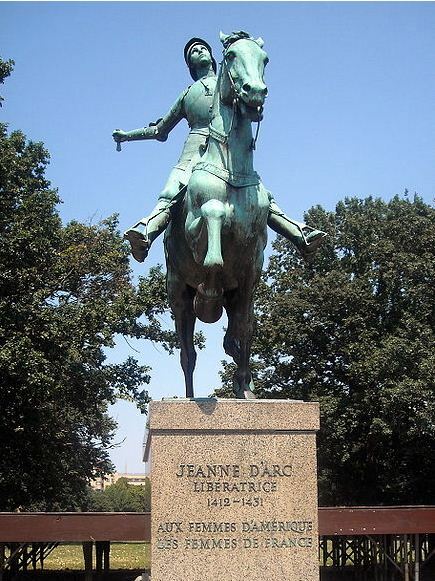 The story of Joan of Arc as we have known it is an almost mythical one, a fantasy of divine proportions. She was a simple French girl from the unsophisticated countryside who took it upon herself to save the country when its leaders could not. She was impelled by the voices of St. Catherine of Siena, St. Margaret, and the Archangel Michael, she said, to follow the will of God. She was to liberate a city, lead an army, save a king, and free a nation from foreign control. The story seems remote, the model suspect, and the voices from heaven not a common way of expressing contemporary spiritual insights or calls from God. In the end, Joan is captured by her English enemies and burned at the stake with the help of churchmen who consider her a heretic, label her a witch, and condemn her to death because of her refusal to denounce her voices as the church has commanded her to do. The relation of all that to sanctity in the twenty-first century seems at best obscure until little by little the local history is peeled away and the light is focused on the very human and very universal situation that underlies it. Joan is not to be revered because she was a soldier in the service of the king. Joan is to be revered because she is a model of conscience development, a monument to the feminine relationship to God, and a breaker of the stereotypes that block the will of God for people. Suddenly, Joan of Arc appears in the plain light of our own lives. She is a woman with a conscience. She is a woman with a mission. She is a woman who has been chosen by God for a man’s job. She is a woman who is bold enough to claim that she has access to God and that God has outrageous plans for her. She is a woman who dares to confront the authorities of the time with a greater question than they are able to handle. She is a woman who threatens the status quo. She tells an inspired truth and leads a life consecrated to her God.